NJLS Next Day is the lowest-cost provider of guaranteed overnight delivery service; with monthly service plans for as low as $3.88 per delivery, clients save as much as 80% compared to global carriers’ next-business day deliveries. Over the past 87 years, NJLS has gone from being a local courier service to a regional one servicing the tri-state, mid-Atlantic and New England areas. When delivering documents or packages for businesses, we quickly and cost-effectively get their jobs done, inspiring confidence in our expertise. NJLS has received the Gold “Best Courier Service” seal by legal professionals who voted in the 2012, 2013, 2014, and 2015 New Jersey Law Journal (NJLJ) Reader Rankings surveys. With its decades-long exemplary courier record, NJLS has expanded its business-to-business pickup and delivery offerings to the realty and bank industries, to the medical community, and to counties and municipalities throughout the region. In 2013, NJLS and the New Jersey Lawyers Diary and Manual completed a comprehensive analysis of overnight delivery costs among two major courier companies: UPS and FedEx (see graphic). The data concluded NJLS has a significantly less expensive overnight delivery service—with savings ranging from 50% to 82% compared to the standard and special published rates of the two major overnight couriers. The average savings per attorney in the state of New Jersey are $1,800 per year. For more information about NJLS Next Day, please download the PDF. 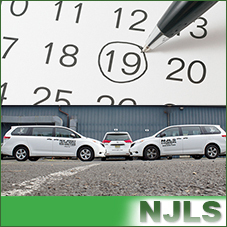 For a detailed overnight courier rate schedule for NJLS Next Day download the PDF. The majority of NJLS clients purchase a month-to-month plan, entitling them to a certain number of monthly deliveries for a flat rate. Overages are charged at rates equaling that monthly number of deliveries divided by the monthly cost. Every shipping label is bar coded for tracking. Log on to the NJLS Client Login site to see the status of any delivery—24/7 from anywhere. NJLS scans all packages at pickup, in the warehouse, when dispatched and when delivered. Clients can check online the status of any package by securely signing into the Client Login site. Delivery slips are created by clients’ own address books on any 8 ½ x 11” paper or inexpensive labels specially designed for NJLS clients. NJLS’ green initiatives are expected to generate a savings of about $52,000 in annual fuel, electricity and maintenance costs. Our lower operational costs not only become your lower costs but also reduce the carbon footprint. All NJLS vehicles are equipped with scanners, mobile phones, global positioning system (GPS) units and driver monitoring units to ensure driver safety and safe driver behavior. NJLS personnel are uniformed, carry ID credentials identifying themselves as NJLS couriers, and go through a mandatory, twice-a-year safety training program. Every overnight delivery is backed up by a signed receipt and certificate or proof of service suitable for court filing as required. Signatures are available online for up to a year following the delivery date. And, as permitted by courthouse security rules in effect, we deliver directly to judge chambers, clerk and administrator offices. Many of our professional couriers are also licensed New Jersey notaries. NJLS also delivers overnight to New York, Pennsylvania, Connecticut, Delaware, Massachusetts, Maryland, Rhode Island, Virginia, Maine, Vermont and New Hampshire. Please visit the NJLS Web site to check the Zip Code lookup to verify delivery location. When you open an account with us, we’ll send you a monthly bill that allows you to manage your cash flow better than other pay as go services or weekly billing accounts. We also accept credit cards to pay our monthly invoices giving you even greater cash flow flexibility. All our bills reference your client billing reference for easy charge back. High volume users can receive EDI files for direct upload to billing system. To review terms and conditions of NJLS Next Day offerings, please see our Services Guide.